Art for the people, by the people: Boston just got a lot cooler this summer. 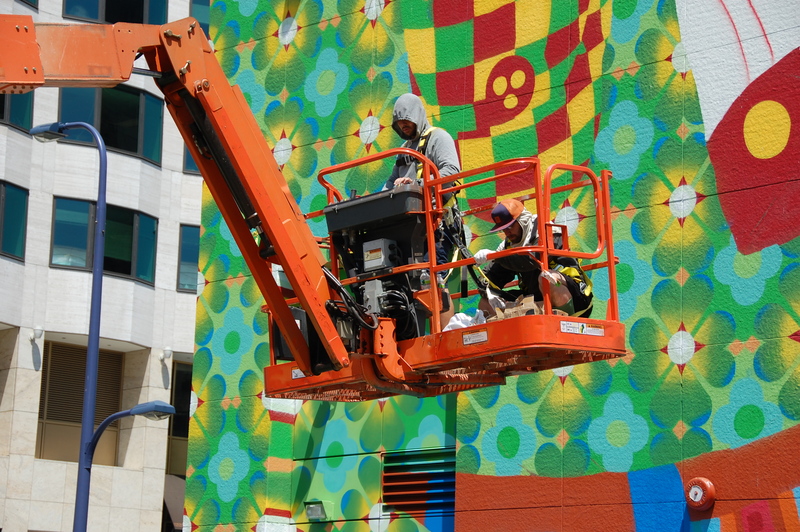 The MassDOT building in Dewey Square, part of Boston’s Rose Kennedy Greenway, is the canvas for an enormous graffiti artwork by twin brothers Gustavo and Otavio Pandolfo, the Brazilian artists known as Os Gêmeos. OWS protesters occupied the square for months last fall, making this an appropriate spot for some serious street art. A much smaller second mural by the twins just went up outside the Revere Hotel on Stuart Street. WBUR‘s arts reporter Andrea Shea did a piece yesterday about the brothers and their art which you can read and listen to here. MassDOT, the Boston Art Commission, and the City of Boston commissioned the brothers to create the piece, featuring their intricate stencils and one of their signature yellow dudes in a hoodie. 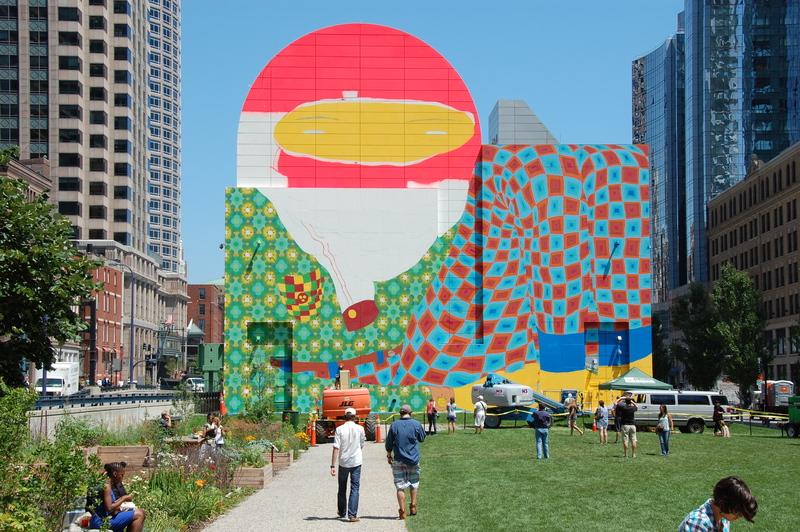 The mural will stay up in Dewey Square for 18 months. After that, it’s anyone’s guess what they do with this big guy. Hopefully he won’t disappear. The people of Boston should keep him safe. The more public art the city has, the better. When I put a photo of the 70′ x 70′ mural on my Facebook page, someone posted a snarky comment saying that the mural doesn’t look like much and a little kid could have made it. Um, wrong answer dude. If it’s so easy, then why aren’t YOU up there doing it?! I think they felt bad though because they took their comment down before I could respond. Art Karma! Anyway, there is something playful, innocent, and a little primitive about Os Gêmeos’s art, which catches you a bit off-guard. It’s total street cred served up with a sense of humor. And it’s pretty freaking huge. It’s supposed to be witty—art can use humor to make a point. The artists aren’t taking everything so seriously, and neither should you. I’m going to the Brazilian Street Party on Friday night at the ICA. We’ll definitely take a break from dancing to check out the new Os Gêmeos exhibit while we’re there. I can’t wait! Thank you for introducing me to the work of Os Gêmeos. I checked out a number of other images by the twins, my favorite being a chimney painted to look like a man sitting on the roof. Os Gêmeos’ whimsy is provocative, and its use of color fresh. Keep on posting!